Flip a coin. Puppy is always heads! The other person is always tails. If heads Puppy gets to kill your guy instantly. If the other person wins that then Puppy card gets 100 damage. Flip a coin! Puppy is heads and the other player is Tails. 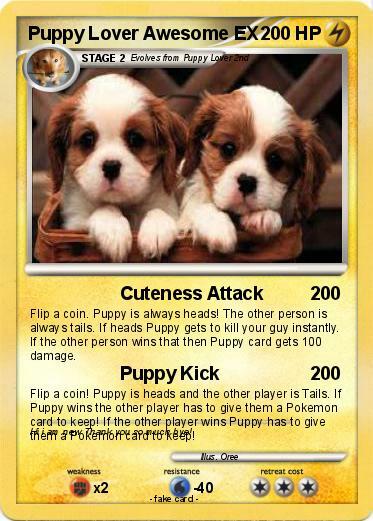 If Puppy wins the other player has to give them a Pokemon card to keep! If the other player wins Puppy has to give them a Pokemon card to keep! Comments : Hi i am new Thank you so much bye!